One of the most succinct definitions of morale came from Albert Sydney Johnson, a Kentucky native who was a Confederate general during the Civil War. This month, it brought the Albany Newspaper Guild no pleasure to reveal that morale among the hard-working families at the Times Union, in a word, stinks. And also to say there is only one place to lay responsibility. At the top. The Hearst Corp. has imposed a wage freeze that will reach its 8th year in August. That has come at a time when staff in various departments continues to shrink, and those workers who remain are being asked to do more and more as goals continue to climb. Due to their efforts, the work continues to get done. But as the work load grows heavier and heavier, people who work at the Times Union continue to see their standard of living erode, year after year as bills rise, but the paycheck never changes. Meanwhile, the company continues to demand exactly what it started demanding in 2008: Workers must hand over complete rights to outsourcing of any job and also destroy a seniority system where a 20-year employee would be shown the door before someone hired the day before yesterday. Even then, the wages will not move. The company offers a one-shot payment, most of which will get swallowed up by taxes and the inevitable increase in health insurance costs. Multiple attempts to negotiate a reasonable compromise have ended with the same answer: NO. People who work here are not stupid. They know that agreeing to such one-sided terms will mean that some people will lose their jobs right away and others will lose their jobs in the days that follow. How many people is anyone’s guess. Each year, the Times Union asks workers around the Capital Region to rate their workplaces. And each year, the places that score highest proudly tout their scores as the best employers the region has to offer. The test is really a test of employee morale. And sadly, the Times Union is failing its own test, and failing it badly. 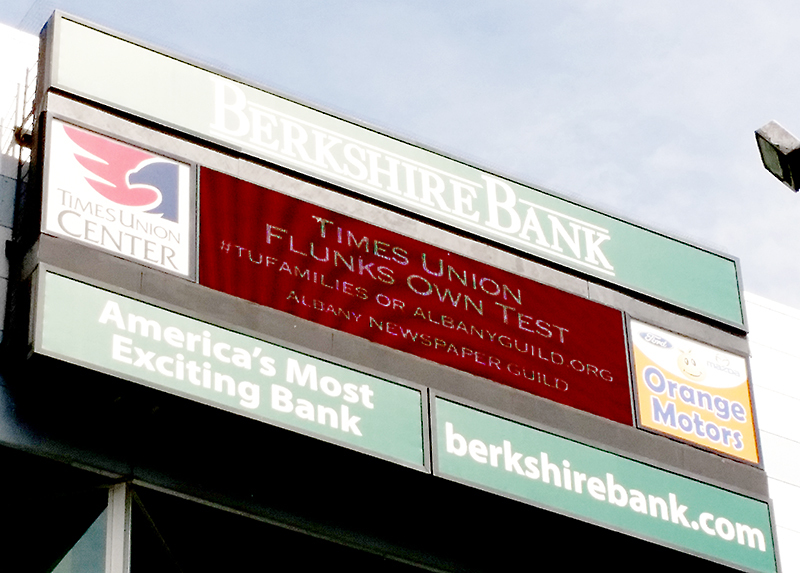 As Albany Guild President Tim O’Brien reported here this month, the Guild asked workers to answer the same questions that the Times Union asked other workers elsewhere. And the results were not pretty. Three workers in four said they no longer feel appreciated. That was a mirror image of workers at the top workplaces. More than half of workers said they no longer had confidence in their future at the Times Union. And nine workers out of ten said they felt left in the dark as to how important decisions get made. It is inspiring to see the top workplaces in the Capital Region and know that workers there have confidence where they are being led. But the Times Union has work to do before it can make its own best-of list. And this raises the question as to the role of the Times Union — or any paper for that matter — in its community. That role is not just about writing corporate checks to get a name on, say, the Times Union Center, or another prominent building. For those in the community who think the time has come for the company to try a new approach, please call 454.5555. Your support is needed. Thank you.